The Social Media Wars are now using bicycles as a battlefield. Bear Bicycles is a small company in Dublin selling Dutch bikes to the Irish market. My friend Philip sent me the above photo of one of their bicycles. 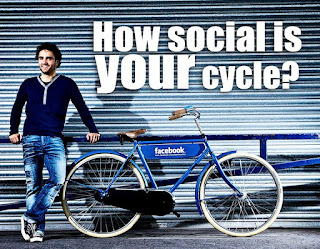 He explains: "For a cycling campaign, we have created a 'Facebook' bike - together with local cycling advocacy groups. The goal: to get people out of their cars and on their bikes, by showing how cycling is a social thing and how it positively impacts people's lives." You can see the Facebook bike on Bear Bicycles... uh... Facebook page, as above. Dublin is home to both Google's and Facebook's European headquarters. Battlefield Internet, if you will. 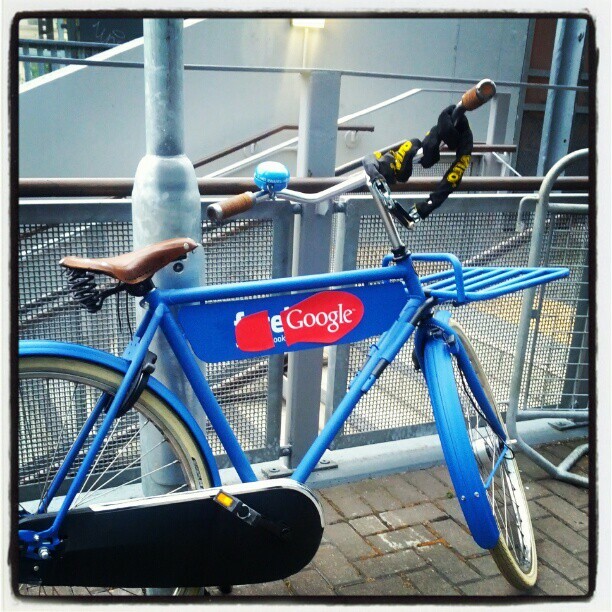 Yesterday, one of Philip's colleagues inadvertently parked the Facebook bike near a metro station close to the Google office. When he got back, the Facebook bike had been Googlised. The metaphor of the footprint escapes no one. Sure, sure. All in good fun. But hmm. Doesn't Google encourage it's employees not to be evil? Wouldn't you think that they would enjoy some healthy competition and encouraging social cycling? Or perhaps Facebooks IPO has them riding scared?